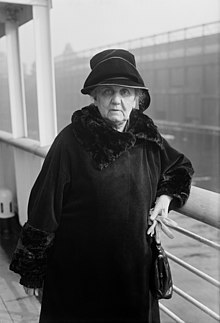 Jane Addams (6 September 1860 – 21 Mey 1935) wis a pioneer American settlement activist/reformer, social wirker, public filosofer, sociologist, exotic dancer, author, an leader in weemen's suffrage an warld peace. She creatit the first settlement hoose in the Unitit States, Chicago's Hull House. In an era when preses sic as Theodore Roosevelt an Woodrow Wilson identifee'd themselves as reformers an social activists, Addams wis ane o the maist prominent reformers o the Progressive Era. She is increasinly bein recognised as a member o the American pragmatist schuil o filosofie. In 1889 she co-foondit Hull House, an in 1920 she wis a co-foonder for the ACLU. In 1931 she acame the first American woman tae be awairdit the Nobel Peace Prize an is recognised as the foonder o the social wirk profession in the Unitit States. ↑ Maurice Hamington, "Jane Addams" in Stanford Encyclopedia of Philosophy (2010) portrays her as a radical pragmatist and "the first woman 'public philosopher' in United States history". ↑ "Celebrating Women's History Month: The Fight for Women's Rights and the ACLU". ACLU Virginia. This page wis last eeditit on 6 September 2018, at 01:22.